Occurrences in the vicinity of the Castle Dome (Pinto Valley) copper deposit. Description: As a hydrothermal alteration product of quartz monzonite. Reference: Anthony, J.W., et al (1995), Mineralogy of Arizona, 3rd.ed. : 105; Peterson, N.P. (1962), Geology and ore deposits of the Globe-Miami district, AZ, USGS PP 342. Reference: Anthony, J.W., et al (1995), Mineralogy of Arizona, 3rd.ed. : 112; Peterson, N.P. (1962), Geology and ore deposits of the Globe-Miami district, AZ, USGS PP 342. Description: As veinlets of hydrothermal origin cutting Scanlan Conglomerate and arkoses of the Pioneer Formation, where these rocks have been metamorphosed as result of the intrusion of the Lost Gulch quartz monzonite. Reference: Anthony, J.W., et al (1995), Mineralogy of Arizona, 3rd.ed. : 116; Peterson, N.P. (1962), Geology and ore deposits of the Globe-Miami district, AZ, USGS PP 342: 75. Reference: Anthony, J.W., et al (1995), Mineralogy of Arizona, 3rd.ed. : 121. Reference: Anthony, J.W., et al (1995), Mineralogy of Arizona, 3rd.ed. : 125; Peterson, N.P. (1947), Phosphate minerals in the castle Dome copper deposit, AZ, Am.Min. : 32: 574-582. Description: Small amounts in open fractures with fluorite, southern part of the mine; incrustations and clusters of simple pinacoidal crystals coated with sine-grained drusy quartz. Coated with jarosite in some places. Disseminated in dense masses of halloysite clay. Reference: Anthony, J.W., et al (1995), Mineralogy of Arizona, 3rd.ed. : 127, 223; Peterson, N.P., et al (1946), Hydrothermal alteration in the Castle Dome copper deposit, AZ, Econ.Geol. : 41: 820-840; Peterson, N.P. (1962), Geology and ore deposits of the Globe-Miami district, AZ, USGS PP 342: 73, 74; Galbraith, F.W. & D.J. Brennan (1959), Minerals of AZ: 43, 57. Description: Occurs in veinlets & fine aggregates & as scattered flakes in altered quartz monzonite. Reference: Anthony, J.W., et al (1995), Mineralogy of Arizona, 3rd.ed. : 132; Peterson, N.P., et al (1946), Hydrothermal alteration in the Castle Dome copper deposit, AZ, Econ.Geol. : 41: 820-840; Peterson, N.P. (1962), Geology and ore deposits of the Globe-Miami district, AZ, USGS PP 342; Galbraith, F.W. & D.J. Brennan (1959), Minerals of AZ: 108. Description: Occurs in the Lost Gulch quartz monzonite. Books of biotite in parts of the mineralized area have been reconstituted into irregular aggregates of small biotite flakes. Reference: Peterson, N.P. (1962), Geology and ore deposits of the Globe-Miami District, Arizona, USGS PP 342: 79. Description: Occurs replacing chalcopyrite in upper portion of deposit. Reference: Anthony, J.W., et al (1995), Mineralogy of Arizona, 3rd.ed. : 163; Peterson, N.P., et al (1946), Hydrothermal alteration in the Castle Dome copper deposit, AZ, Econ.Geol. : 41: 820-840; Peterson, N.P. (1947), Phosphate minerals in the Castle Dome copper deposit, AZ, Am.Min. : 32: 574-582; Peterson, N.P. (1962), Geology and ore deposits of the Globe-Miami district, AZ, USGS PP 342: 70; Simmons, W.W. & J.E. Fowells (1966), Geology of the Copper Cities Mine, in S.R. Titley and C.L. Hicks (eds. ), Geology of the porphyry copper deposits, southwestern North America, Univ. of AZ Press, Tucson: 151-156. Reference: Anthony, J.W., et al (1995), Mineralogy of Arizona, 3rd.ed. : 165; Peterson, N.P. (1962), Geology and ore deposits of the Globe-Miami District, Arizona, USGS PP 342: 70; Galbraith, F.W. 1947), Minerals of AZ, AZ Bur. of Mines Bull. 153: 19. Description: Associated with calcite & epidote as an alteration product of biotite in the feebly altered quartz monzonite surrounding the deposit. Description: As stringers & scattered grains in sericitized plagioclase of the quartz monzonite. Reference: Anthony, J.W., et al (1995), Mineralogy of Arizona, 3rd.ed. : 179; Peterson, N.P. (1962), Geology and ore deposits of the Globe-Miami district, AZ, USGS PP 342: 78; Peterson, N.P., et al (1946), Hydrothermal alteration in the Castle Dome copper deposit, AZ, Econ.Geol. : 41: 820-840; Peterson, N.P., et al (1951), Geology and ore deposits of the castle Dome area, Gila Co., USGS Bull. 971; Creasey, S.C. (1959), Some phase relations in the hydrothermally altered rocks of porphyry copper deposits, Economic Geology: 54: 351-373; Galbraith, F.W. & D.J. Brennan (1959), Minerals of AZ: 99. 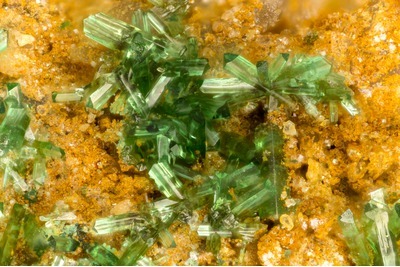 Description: As an uncommon secondary mineral. Reference: Anthony, J.W., et al (1995), Mineralogy of Arizona, 3rd.ed. : 185; Peterson, N.P., et al (1946), Hydrothermal alteration in the Castle Dome copper deposit, AZ, Econ.Geol. : 41: 820-840; Peterson, N.P., et al (1951), Geology and ore deposits of the castle Dome area, Gila Co., USGS Bull. 971. Reference: Anthony, J.W., et al (1995), Mineralogy of Arizona, 3rd.ed. : 190; Peterson, N.P. (1947), Phosphate minerals in the castle Dome copper deposit, AZ, Am.Min. : 32: 574-582; Peterson, N.P. (1962), Geology and ore deposits of the Globe-Miami district, AZ, USGS PP 342. Reference: Anthony, J.W., et al (1995), Mineralogy of Arizona, 3rd.ed. : 196. Description: Occurs in the marginalized parts of the mineralized area (most feebly hydrothermally altered zone). Reference: Anthony, J.W., et al (1995), Mineralogy of Arizona, 3rd.ed. : 214; Peterson, N.P., et al (1946), Hydrothermal alteration in the Castle Dome copper deposit, AZ, Econ.Geol. : 41: 820-840; Creasey, S.C. (1959), Some phase relations in the hydrothermally altered rocks of porphyry copper deposits, Economic Geology: 54: 351-373; Peterson, N.P. (1962), Geology and ore deposits of the Globe-Miami district, AZ, USGS PP 342: 78. Description: Occurs within a foot or two (30 to 60 cm) of surface in the leached capping of the deposit. Reference: Anthony, J.W., et al (1995), Mineralogy of Arizona, 3rd.ed. : 220; Peterson, N.P. (1962), Geology and ore deposits of the Globe-Miami district, AZ, USGS PP 342; Peterson, N.P., et al (1951), Geology and ore deposits of the Castle Dome area, Gila Co., USGS Bull. 971. Description: Occurs as a few crusts and small clusters of crystals in open fractures associated and comb quartz, southern part of the mine. Reference: Anthony, J.W., et al (1995), Mineralogy of Arizona, 3rd.ed. : 127, 223; Peterson, N.P., et al (1946), Hydrothermal alteration in the Castle Dome copper deposit, AZ, Econ.Geol. : 41: 820-840; Peterson, N.P., et al (1951), Geology and ore deposits of the castle Dome area, Gila Co., USGS Bull. 971; Peterson, N.P. (1962), Geology and ore deposits of the Globe-Miami district, AZ, USGS PP 342: 73; Galbraith, F.W. & D.J. 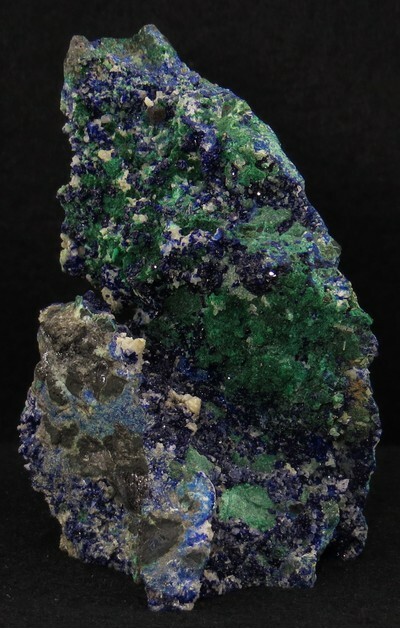 Brennan (1959), Minerals of AZ: 43, 57. Description: In veins with sphalerite cutting across the veinlets containing pyrite, chalcopyrite, & molybdenite. Reference: Peterson, N.P. (1962), Geology and ore deposits of the Globe-Miami district, AZ, USGS PP 342: 69, 70; Anthony, J.W., et al (1995), Mineralogy of Arizona, 3rd.ed. : 228; Brush, G.J. (1873), On a compact anglesite from AZ, Amer.Jour.Sci. : 5: 421-422; Peterson, N.P., et al (1946), Hydrothermal alteration in the Castle Dome copper deposit, AZ, Econ.Geol. : 41: 820-840; Peterson, N.P. (1947), Phosphate minerals in the castle Dome copper deposit, AZ, Am.Min. : 32: 574-582. Reference: Peterson, N.P. (1962), Geology and ore deposits of the Globe-Miami district, AZ, USGS PP 342: 77, 134. Reference: MRDS database Dep. ID #10027321, MRDS ID #M002863. Reference: Anthony, J.W., et al (1995), Mineralogy of Arizona, 3rd.ed. : 266; Schwartz, G.M. (1947), Hydrothermal alteration in the 'porphyry copper' deposits, Econ.Geol. : 42: 319-352; Galbraith, F.W. & D.J. Brennan (1959), Minerals of AZ: 108. Description: Small quantities in the capping & in the chalcocite zone in quartz monzonite. Reference: Anthony, J.W., et al (1995), Mineralogy of Arizona, 3rd.ed. : 213; Peterson, N.P., et al (1946), Hydrothermal alteration in the Castle Dome copper deposit, AZ, Econ.Geol. : 41: 820-840; Galbraith, F.W. & D.J. Brennan (1959), Minerals of AZ: 108. Description: Tiny, rounded grains in clay. Reference: Anthony, J.W., et al (1995), Mineralogy of Arizona, 3rd.ed. : 248; Peterson, N.P., et al (1951), Geology and ore deposits of the Castle Dome area, Gila Co., USGS Bull. 971. Reference: Anthony, J.W., et al (1995), Mineralogy of Arizona, 3rd.ed. : 251; Peterson, N.P., et al (1951), Geology and ore deposits of the Castle Dome area, Gila Co., USGS Bull. 971; Peterson, N.P. (1947), Phosphate minerals in the Castle Dome copper deposit, AZ, Am.Min. : 32: 574-582. Description: As tabular pieces in quartz. Reference: Anthony, J.W., et al (1995), Mineralogy of Arizona, 3rd.ed. : 257; Peterson, N.P., et al (1946), Hydrothermal alteration in the Castle Dome copper deposit, AZ, Econ.Geol. : 41: 820-840; Peterson, N.P., et al (1951), Geology and ore deposits of the Castle Dome area, Gila Co., USGS Bull. 971; Galbraith, F.W. & D.J. Brennan (1959), Minerals of AZ: 29. Description: Abundant supergene mineral in leached capping and in the oxidized zone; coats barite. Reference: Anthony, J.W., et al (1995), Mineralogy of Arizona, 3rd.ed. : 251, 286; Peterson, N.P. (1947), Phosphate minerals in the Castle Dome copper deposit, AZ, Am.Min. : 32: 574-582; Peterson, N.P. (1962), Geology and ore deposits of the Globe-Miami district, AZ, USGS PP 342: 74, 75; Peterson, N.P., et al (1951), Geology and ore deposits of the Castle Dome area, Gila Co., USGS Bull. 971; Galbraith, F.W. & D.J. Brennan (1959), Minerals of AZ: 64. Description: As small masses filling open fractures in quartz monzonite. Reference: Anthony, J.W., et al (1995), Mineralogy of Arizona, 3rd.ed. : 266; Schwartz, G.M. (1947), Hydrothermal alteration in the 'porphyry copper' deposits, Econ.Geol. : 42: 319-352. Reference: Galbraith, F.W. & D.J. Brennan (1959), Minerals of AZ: 79. Description: Botryoidal and sintery crusts in open fractures and in veinlets from which sulfides were leached. Reference: Peterson, N.P. (1962), Geology and ore deposits of the Globe-Miami District, Arizona, USGS PP 342: 73; Anthony, J.W., et al (1995), Mineralogy of Arizona, 3rd.ed. : 251. Description: Pyrometasomatic deposits in Martin limestone. Reference: Peterson, N.P. (1962), Geology and ore deposits of the Globe-Miami District, Arizona, USGS PP 342: 73, 134. Description: Commonly on crusts of wavellite that line the walls of open fractures in the secondary sulfide zone. Reference: Anthony, J.W., et al (1995), Mineralogy of Arizona, 3rd.ed. : 296; Peterson, N.P. (1947), Phosphate minerals in the Castle Dome copper deposit, AZ, Am.Min. : 32: 574-582; Peterson, N.P. (1962), Geology and ore deposits of the Globe-Miami District, Arizona, USGS PP 342: 76. Description: Occurs in small quantities in ore.
Reference: Anthony, J.W., et al (1995), Mineralogy of Arizona, 3rd.ed. : 301; Peterson, N.P. (1947), Phosphate minerals in the Castle Dome copper deposit, AZ, Am.Min. : 32: 574-582; Peterson, N.P., et al (1946), Hydrothermal alteration in the Castle Dome copper deposit, AZ, Econ.Geol. : 41: 820-840; Peterson, N.P., et al (1951), Geology and ore deposits of the Castle Dome area, Gila Co., USGS Bull. 971; Peterson, N.P. (1962), Geology and ore deposits of the Globe-Miami District, Arizona, USGS PP 342: 70, 77; Galbraith, F.W. 1947), Minerals of AZ, AZ Bur. of Mines Bull. 153: 24. Description: Occurs in host rocks. Reference: Anthony, J.W., et al (1995), Mineralogy of Arizona, 3rd.ed. : 304; Schwartz, G.M. (1947), Hydrothermal alteration in the 'porphyry copper' deposits, Econ.Geol. : 42: 319-352; . Reference: Anthony, J.W., et al (1995), Mineralogy of Arizona, 3rd.ed. : 309; Creasey, S.C. (1959), Some phase relations in the hydrothermally altered rocks of porphyry copper deposits, Economic Geology: 54: 351-373; Schwartz, G.M. (1947), Hydrothermal alteration in the 'porphyry copper' deposits, Econ.Geol. : 42: 319-352; Peterson, N.P. (1962), Geology and ore deposits of the Globe-Miami district, AZ, USGS PP 342: 77. Description: Minute crystals in some quartz veinlets containing chalcopyrite and molybdenite & in sericitic altered border zones of some quartz-pyrite veinlets. Reference: Peterson, N.P. (1962), Geology and ore deposits of the Globe-Miami district, AZ, USGS PP 342: 77. Reference: Galbraith, F.W. & D.J. Brennan (1959), Minerals of AZ: 70. 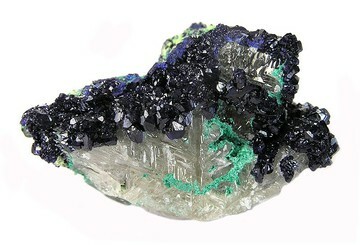 Description: Abundant in the chalcocite zone. Reference: Anthony, J.W., et al (1995), Mineralogy of Arizona, 3rd.ed. : 341; Peterson, N.P. (1947), Phosphate minerals in the Castle Dome copper deposit, AZ, Am.Min. : 32: 574-582; Peterson, N.P. (1962), Geology and ore deposits of the Globe-Miami District, Arizona, USGS PP 342: 70, 71, 77. Description: Product of clay mineral phase of alteration; recrystallized from titanite & ilmenite. Reference: Anthony, J.W., et al (1995), Mineralogy of Arizona, 3rd.ed. : 358; Peterson, N.P., et al (1946), Hydrothermal alteration in the Castle Dome copper deposit, AZ, Econ.Geol. : 41: 820-840; Schwartz, G.M. (1947), Hydrothermal alteration in the 'porphyry copper' deposits, Econ.Geol. : 42: 319-352. Description: As waxy lumps in manganous material. Reference: Anthony, J.W., et al (1995), Mineralogy of Arizona, 3rd.ed. : 361; Galbraith, F.W. & D.J. Brennan (1959), Minerals of AZ: 109. Description: Occurs altering to sulphur; In veins with galena cutting across the veinlets containing pyrite, chalcopyrite, & molybdenite. Reference: Peterson, N.P. (1962), Geology and ore deposits of the Globe-Miami district, AZ, USGS PP 342: 69, 70. Description: Occurs in altered quartz monzonite. Reference: Anthony, J.W., et al (1995), Mineralogy of Arizona, 3rd.ed. : 383; Peterson, N.P. (1962), Geology and ore deposits of the Globe-Miami district, AZ, USGS PP 342: 78; Peterson, N.P., et al (1951), Geology and ore deposits of the Castle Dome area, Gila Co., USGS Bull. 971. 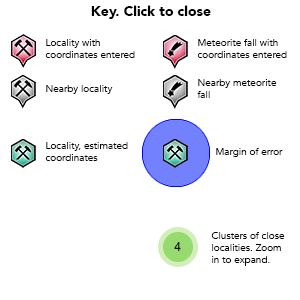 Description: Occurs in open spaces in veins; thin films in fractures in sphalerite. 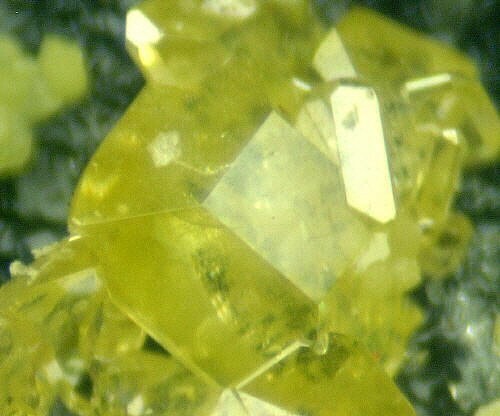 Formed by oxidation of galena & sphalerite. Reference: Anthony, J.W., et al (1995), Mineralogy of Arizona, 3rd.ed. : 386; Peterson, N.P. (1962), Geology and ore deposits of the Globe-Miami district, AZ, USGS PP 342; Peterson, N.P., et al (1951), Geology and ore deposits of the Castle Dome area, Gila Co., USGS Bull. 971. Description: A minor accessory mineral in quartz monzonite. Description: Occasional prisms observed in thin sections of argillized plagioclase phenocrysts. Reference: Peterson, N.P. (1962), Geology and ore deposits of the Globe-Miami district, AZ, USGS PP 342: 78. Description: Occurs in substantial quantities in the leached capping and chalcocite zone. Reference: Anthony, J.W., et al (1995), Mineralogy of Arizona, 3rd.ed. : 404; Peterson, N.P., et al (1946), Hydrothermal alteration in the Castle Dome copper deposit, AZ, Econ.Geol. : 41: 820-840; Peterson, N.P. (1962), Geology and ore deposits of the Globe-Miami district, AZ, USGS PP 342; Peterson, N.P., et al (1951), Geology and ore deposits of the Castle Dome area, Gila Co., USGS Bull. 971; Simmons, W.W. & J.E. Fowells (1966), Geology of the Copper Cities Mine, in S.R. Titley and C.L. Hicks (eds. ), Geology of the porphyry copper deposits, southwestern North America, Univ. of AZ Press, Tucson: 151-156; Galbraith, F.W. & D.J. Brennan (1959), Minerals of AZ: 74. Description: Occurs localized as incrustations on the walls of fractures within the chalcocite zone. Reference: Anthony, J.W., et al (1995), Mineralogy of Arizona, 3rd.ed. : 296, 418; Peterson, N.P. (1947), Phosphate minerals in the Castle Dome copper deposit, AZ, Am.Min. 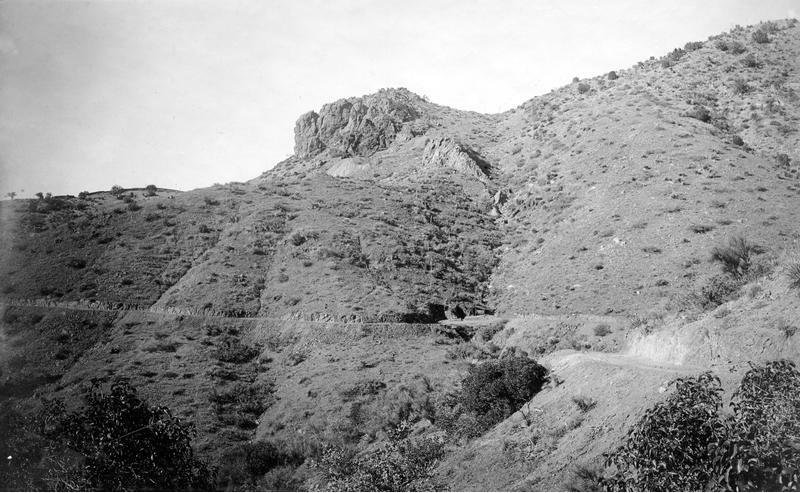 : 32: 574-582; Peterson, N.P., et al (1951), Geology and ore deposits of the Castle Dome area, Gila Co., USGS Bull. 971; Peterson, N.P. (1962), Geology and ore deposits of the Globe-Miami District, Arizona, USGS PP 342: 76; Galbraith, F.W. & D.J. Brennan (1959), Minerals of AZ: 74. Reference: Anthony, J.W., et al (1995), Mineralogy of Arizona, 3rd.ed. : 425; Peterson, N.P. (1947), Phosphate minerals in the Castle Dome copper deposit, AZ, Am.Min. : 32: 574-582; Peterson, N.P., et al (1951), Geology and ore deposits of the Castle Dome area, Gila Co., USGS Bull. 971. Peterson, Nels P., et al (1946), Hydrothermal alteration in the Castle Dome copper deposit, Arizona, Economic Geology: 41: 820-840. Peterson, Nels P. (1947), Phosphate minerals in the Castle Dome copper deposit, Arizona, American Mineralogist: 32: 574-582. Peterson, Nels P., et al (1951), Geology and ore deposits of the Castle Dome area, Gila County, USGS Bull. 971. Peterson, Nels P. (1962), Geology and ore deposits of the Globe-Miami district, Arizona, USGS PP 342: 75, 79. Galbraith, F.W. & D.J. Brennan (1959), Minerals of Arizona: 29, 79, 109. Anthony, J.W., et al (1995), Mineralogy of Arizona, 3rd. ed. : 116, 257, 361, 425.